A post over at Zoologix brought the pitcher plant species Nepenthes lowii a.k.a. Low's Pitcher Plant to my attention. It is a pitcher plant that grows in Borneo and scientists have discovered a fascinating relationship between the plant and tree shrew. The plant produces a sweet nectar that attracts the shrews. This creation of nectar is not unusual. 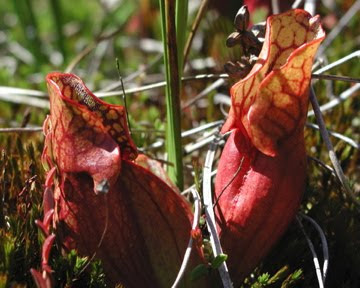 Many pitcher plants use attractants to lure animals to their deaths. Nepenthes lowii however, lures tree shrews to the plant not to trap and eat them but in order to collect their feces. Yup, you read that right. Evolutionary selection pressures have created a perfect toilet for tree shrews. The plants attract the shrews who come to feed and they in turn make a deposit into the pitcher of the plant. The droppings are rich in nitrogen which the plants need to grow. 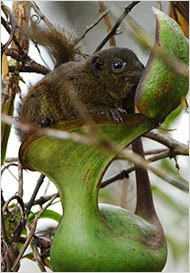 The details were outlined in the paper, Tree shrew lavatories: a novel nitrogen sequestration strategy in a tropical pitcher plant by Charles M. Clarke, Ulrike Bauer, Ch'ien C. Lee, Andrew A. Tuen, Katja Rembold and Jonathan A. Moran. I'm always interested in pitcher plants as we have a bog at work and I teach about these unique plants. The plants in Borneo are old world pitcher plants that belong to the family Nepenthaceae. The pitcher plants in our bog are part of the unrelated new world family Sarraceniaceae and are formed quite differently. The two families are placed into different clades and they are examples of convergent evolution. In Sarraceniaceae pitcher plants, the pitcher is comprised of the entire leaf of the plant. Indeed, there is little more to the plant than a rosette of leaves rising out of moss. Nepenthaceae pitcher plants by contrast are often vine-like and can rise high into trees. According to the excellent book, The Book of Swamp and Bog: Trees, Shrubs, and Wildflowers of the Eastern Freshwater Wetlands by John Eastman, the Sarracenia purpurea pitcher plant that we have in the bog at work is host to a variety of organisms that thrive in the mini-ecosystem created by the plant. Animals that live in a created host environment such as this are called inquilines from the latin "inquilinus" meaning lodger or tenant. Two of the most common inquilines in S. purpurea are the pitcher plant mosquito and the pitcher plant midge. While perhaps not as surprising or novel as the relationship between tree shrews and Nepenthes lowii, our local pitcher plants are host to dozens of species that depend on them. They are some of the most fascinating plants I have had the pleasure to study and enjoy. Thanks for the book suggestion- I'll put it on reserve at the library. I've seen pitcher plants in the wild but never here in Minnesota. The type species of Nepenthes hails from my country, Sri Lanka and it is Nepenthes distillatoria, named by none other than the great Linnaeus. So, I hope you know how excited I am to learn this piece of information. Thanks for sharing. Very interesting post... I have grown CP's as a hobby for years and have several species of Nepenthes... an awesome finding in the relationship with the Shrew! They are indeed fascinating plants!